Some years ago we spent a few days in Delphi, one of the most dramatic of ancient Greek archeological sites. Delphi is situated high on the side of Mt Parnassus, a mountain holy to the ancient Greeks, and commands a spectacular view above the Gulf of Corinth. Looking across the Pagasitic Gulf from our house we can see the peak of Mt Parnassus rising up on the mainland, covered in thick snow; the ancients would be surprised to see the ski resorts! Like the ancients, I don’t ski, but I share their reverence for the site which is awe-inspiring and never fails to enthrall and humble me. The famed Oracle of Delphi made her pronouncements in the Temple of Apollo, and great was the fame of each successive oracle. Her prophecy was ambiguous: the person receiving the advice would interpret it to suit his or her purpose, sometimes with catastrophic results, as Croesus found to his cost. 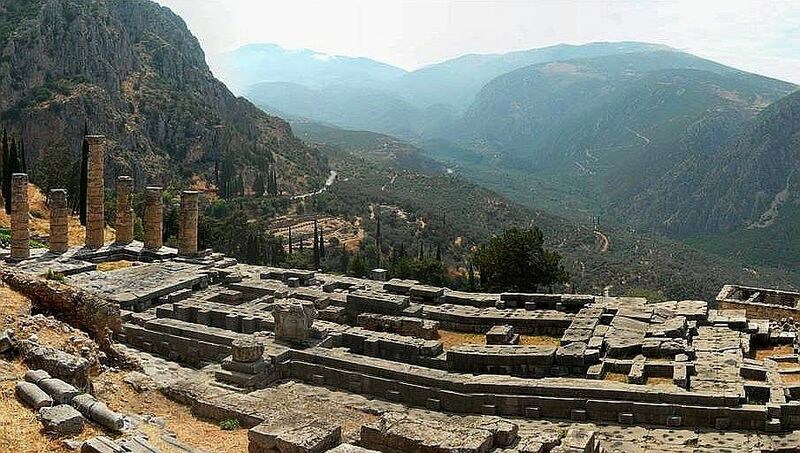 A pilgrimage to Delphi, a place difficult to access, was a memorable experience for those who undertook it in ancient days, and it was for me too on my first visit there, but not entirely because of the ruins and the Archeological Museum. A charming employee at our hotel, Maria, noticed me knitting and told me as we chatted that her mother was a very dedicated knitter, and asked if I might perhaps like to meet her? Would I? Most certainly! There and then it was arranged that Maria, who lived with her mother nearby, would take us home during her lunch hour which she routinely spent taking care of the elderly lady. The Greeks are renowned for their philoxenia, which translates literally to love of the stranger, or hospitality. In spite of her duties Maria managed to purchase a box of delicious cakes before we accompanied her home, where she and her delightful mother were the epitome of philoxenia. Mrs Katerina was a young girl in that war, enduring unimaginable horrors and atrocities, misery and anguish, like so many thousands of others, and, like all those who survived, suffering the effects for the rest of their lives. I have said Mrs Katerina was generous, and she certainly was with her material goods, but it’s her generosity of spirit which I will never forget. Not once did she condemn, not once did she criticize, not once did she express contempt. She answered my probing questions, she told her horrifying stories, but she did not ever pass judgment. Not once. We drank coffee, ate cakes, and talked knitting. And did we talk knitting! Mrs Katerina’s body was very frail, but her mind was razor sharp, her turn of phrase delightful. 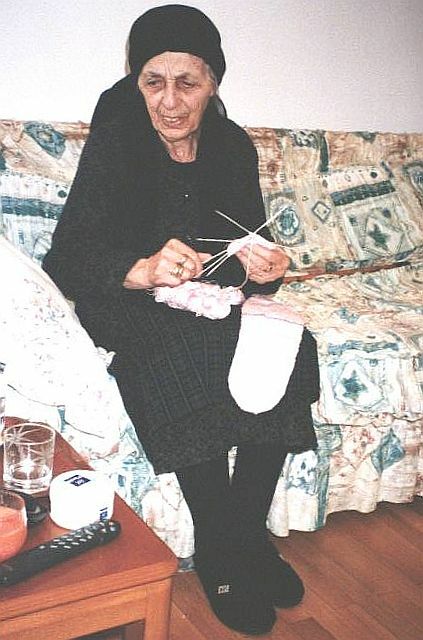 I learnt so much from her, and I don’t refer only to knitting though she was a fountain of knowledge. 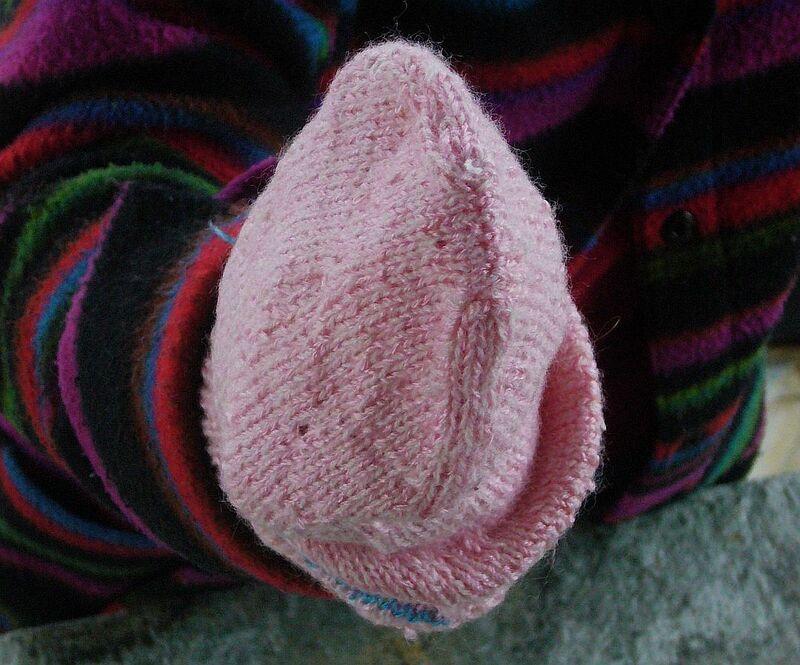 She was working on a sock when we arrived, the second pink sock to the one already completed, the yarn tensioned around her neck in the eastern manner. I was fascinated by her method of inserting the heel into the sock, what Elizabeth Zimmermann would call an ‘afterthought’, and she took great delight in explaining the technique to me, insisting on giving me the sock, in spite of my protestations. The incomparable Kyria Katerina, assured me she would simply knit a replacement for it. I have watched Greek, Turkish and Albanian knitters, some of whom employ this method. 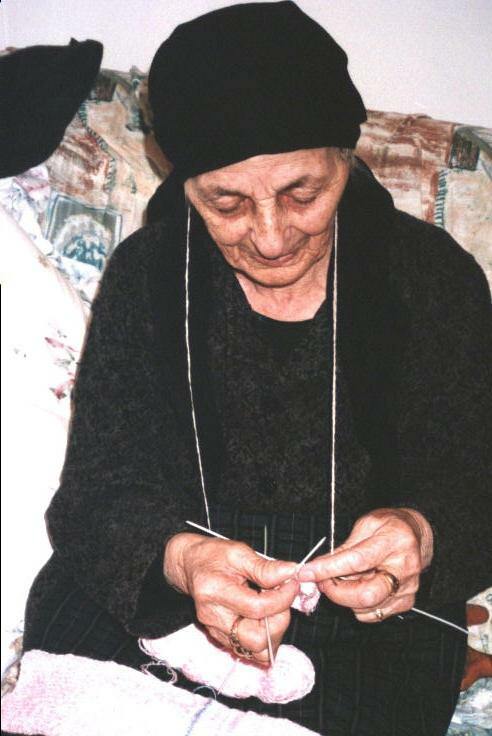 Mrs Katerina learnt to knit stockings as a very small girl, and could recollect no other way of working the heel, saying simply that’s how it was always done in her village. 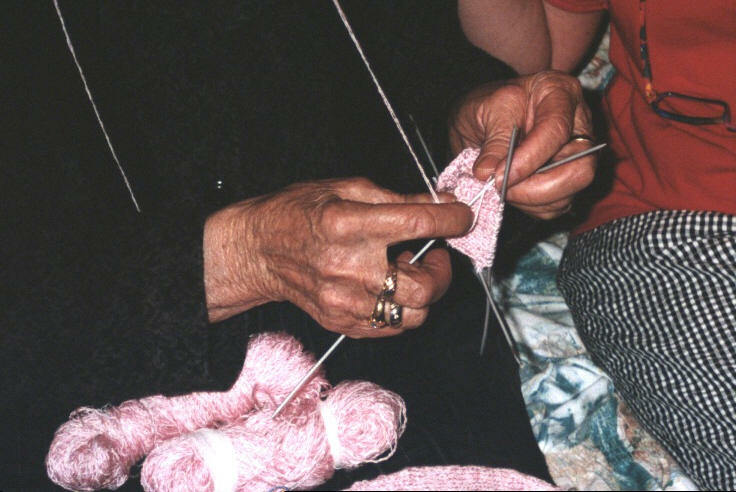 Knitting is a way of life to Mrs Katerina who could not hazard a guess at how many pairs of socks she had knitted over her lifetime. “Pola! Pola!” she happily exclaimed. “Many! 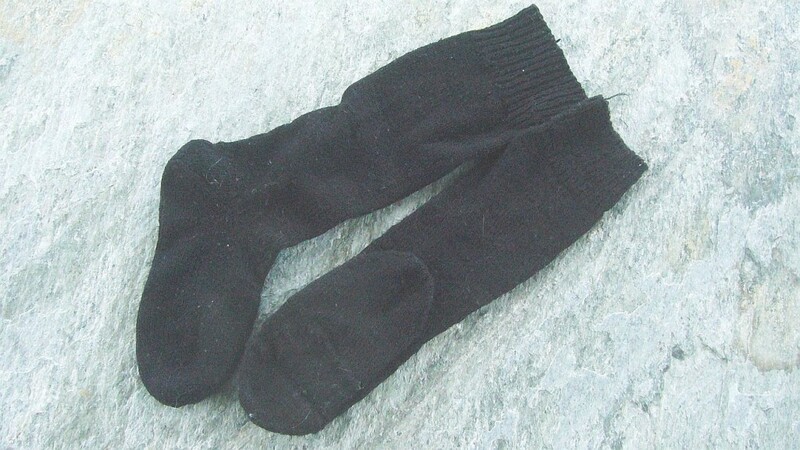 Many!” were the socks she’d produced for herself, her family and her long-dead husband. A widow of many years she dressed only in black, and was determined, absolutely determined, that I accept a pair of her own socks so that I could study the work at my leisure. It was impossible to refuse, and I treasure her gifts. But socks were not enough for the indomitable Kyria Katerina. She loved that I share her name, and wanted me to have something to remember her by, not that I could ever forget her. So her last piece of embroidery I was to have, for her eyesight was fading and knitting was not as taxing for her. 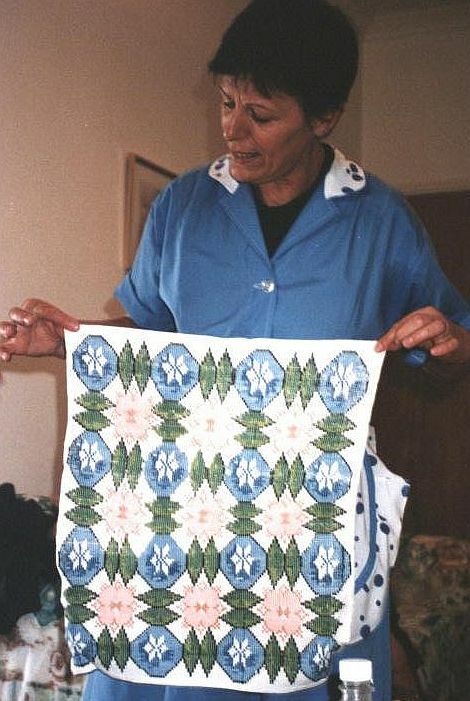 Here it is – a beautiful piece of work in counted thread embroidery – shown by Maria. 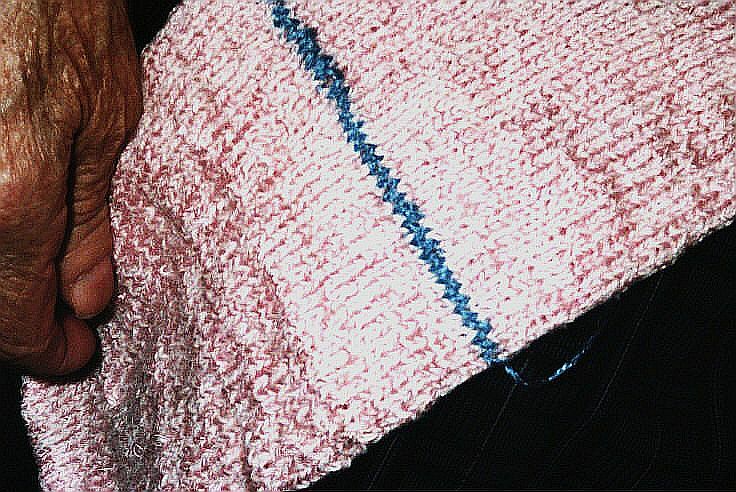 I love the painstaking work, marvel at her patience, delight in the few, the very, very few missed stitches which speak so eloquently of the hand worked item. I’ve thought of framing it, but maybe I’ll turn it into a pillow. Meeting this good lady and her devoted daughter was an experience I can never forget. The warmth and affection extended to us, complete strangers, remains with us still. 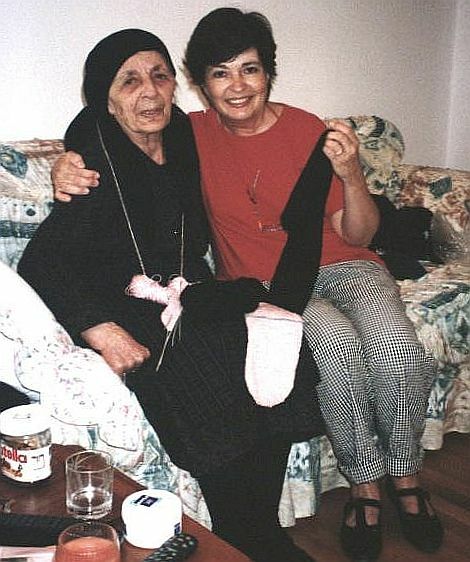 Mrs Katerina, then living in Delphi, is my personal Delphic Oracle for she assured me that whatever was to happen in my life my knitting would always bring me joy. Apollo’s mother, Leto, became pregnant by Zeus, which of course greatly infuriated Hera, although the myths tell us that Leto was already in the family way when Zeus and Hera tied the knot. Zeus was rather fond of Leto, while Hera was anything but. No surprise there. She threw a spectacular hissy fit and one can just imagine the glee with which this tale was told and retold by the ancients as the myths took shape; soap operas are nothing new. Husbands with a wandering eye, betrayed womenfolk, children born outside a formal relationship – these have been well understood from time immemorial, and are the endlessly fascinating stuff of stories in every genre. (Apple SlapDash; Stormy Relationships) she wasn’t one to tolerate her husband’s straying under any circumstances, nor was she going to give lodging to Leto on Mt Olympus. Out! Leave! Banished! So Leto wandered about until Zeus had his fellow god, Boreas of the North Wind, carry Leto out over the sea until she wound up on Delos. Heavy with child, as they say, on this rocky island did the heart wrenching operatic saga continue. Fascinating stuff indeed, but my point is that Apollo was born here. I guess today we’d call Apollo a Renaissance man as he was heavily involved in quite a few things, including music, medicine and minding other people’s business through his role as the god of prophecy in Delphi. His large portfolio included being god of the sun and light, duties performed by Helios in earlier versions of the myths, so one might say Apollo’s was a hostile takeover, although Helios continued to be known as god of the sun, alongside Apollo. No question Apollo took his obligations as sun god very seriously for he never failed to drive his chariot of fire across the world to bring the light. From East to West in regular rhythm did he travel, and we chased him across the sky last week as we flew back to Texas from Greece.